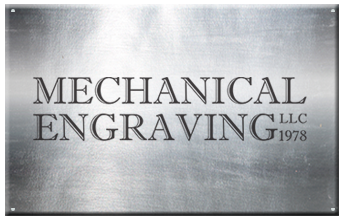 Mechanical Engraving LLC in Bear, Delaware, provides precision industrial engraving services for any surface or material, including data plates and valve tags. We ensure every item is legibly marked for easy reading, with enough area left over for any necessary additions. In addition, we produce vinyl banners and directional signs for use by contractors, refineries, boilermakers, steamfitters, electricians, and more. Data plates must be durable, robust, and suitable for any industrial application. They are generally anodized aluminum, mild steel, or stainless steel. Our laser marking process leaves a black contrast between the background of the plate color and the marking. In addition, we can include areas for variable information to be added. We engrave on any size and material, as well as on sub-surfaces. The corners can be rounded off and holes are pre-drilled. Ideal for chemical plants, foundries, refineries, tank farms, and heat exchangers, our laser-etched stainless steel services provide indelible black etching on any stainless steel surface. With a bright finish, the contrast is brilliant. Specializing in any stainless steel hardness alloys, we provide indelible non-colored marking on all metals for refineries, tank builders, and chemical plants. 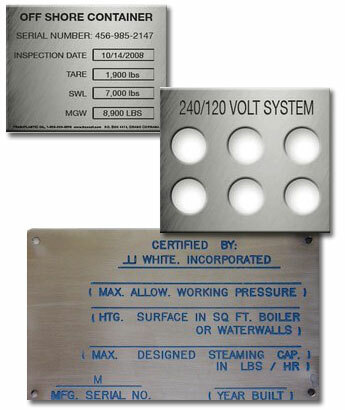 Plates can be fabricated to your exact dimensions and marking specs. We use a new marking method so plates can be done quickly and efficiently to reduce our labor and tooling costs—which means even more savings for you.